It’s a paradise for skiing and outdoors enthusiasts, biking aficionados, and of course beer lovers. But it’s also, perhaps most importantly, a vast agricultural development hub. At AGPROfessionals, we are a Colorado-based agricultural development team here to help current and prospective professionals break into the industry and find success. From agriculture consulting to helping farmers discover farmland for sale, we do it all. And while we are happy to serve the surrounding area including Nevada, Utah, Nebraska, Kansas, and beyond, we will always have a special place in our heart for our home state. That’s why in this blog, we’ll be highlighting some of Colorado’s great agricultural prowess with some facts and figures about farming and agriculture here in the Centennial State. 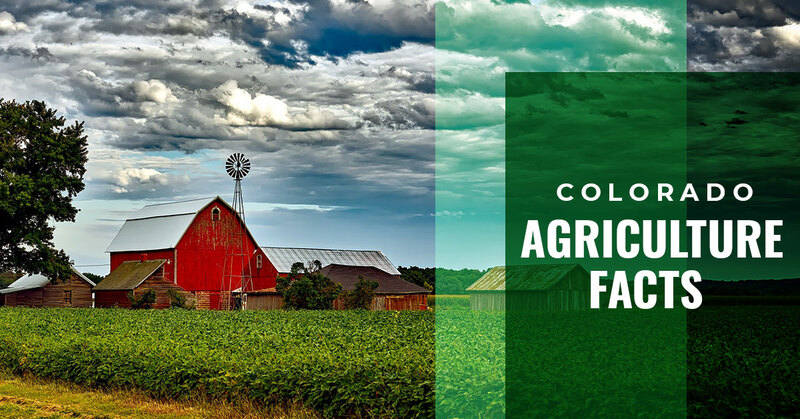 Keep reading to learn a whole crop of facts about ag in Colorado, and contact us today if you’re searching for assistance with agricultural development services including real estate, consulting, financial aid, engineering, and more. With a little help from the Colorado Department of Agriculture, we have compiled a bevy of facts and figures to educate you on all that this great state has to offer. Colorado is more than just a central hub for beer — which is partly possible because of the local grains and ingredients that are grown on Colorado soil. The state also produces a wide range of fresh produce, including world-famous fruits (Rocky Ford melons and Palisade peaches, anyone? ), vegetables, and more. These products contributed to some $6.3 billion in cash receipts that year. That amount was achieved with the help of some 34,000-opus farms and ranches across the state, according to the Department of Agriculture. And speaking of beer, these local farms help produce more than eight million bushels of barley each and every year. Weld County: The home county of AGPROfessionals, Weld County is one of the most happening agricultural hubs in the state. Spreading from Greeley to Fort Lupton, Weld produces products like cattle/dairy, wheat, corn, sheep, hay, and vegetables. Yuma County: One of Colorado’s northernmost counties to the east is accountable for upwards of $1.2 billion in agricultural market value each year. With vast open space to raise cattle and hogs, as well as ample soil for corn and wheat, the cities of Wray and Yuma lead the way. Otero County: Home to those world famous Rocky Ford melons, Otero County is another area responsible for providing vast agricultural contributions. Otero is known for its melons, cattle hay, corn, and other vegetables. Ready to find your own agricultural development success in Colorado? Get help from AGPROfessionals and get the professional solutions you deserve!